Even this late in his career, Martin Scorsese can still reinvent himself, even if it means not changing at all. “Hugo,” based on the award-winning children’s book “The Invention of Hugo Cabret” by Brian Selznick, is the rare PG-rated Scorsese film. However, that does not make it a children’s movie as many have labeled it. “Hugo” is for everyone. “Hugo” is mechanical, yet magical. 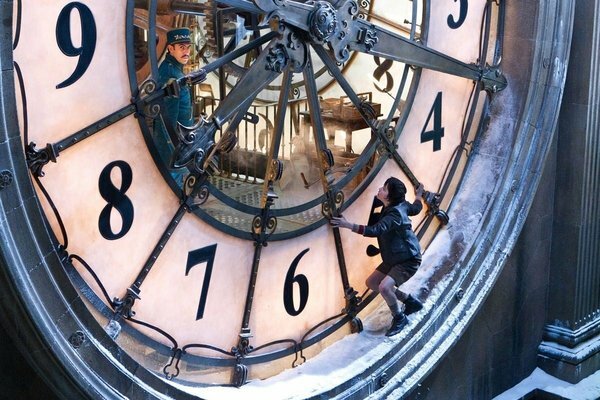 In the early 1930s, Hugo (Asa Butterfield) lives inside the walls of a Parisian train station, operating all of the station’s clocks. He has been doing this ever since his father (Jude Law) died and left him as an orphan. His life inside the walls gives him an innate ability to sneak around totally undetected. He steals in order to get by, which puts him at constant odds with the scheming and ill-tempered station inspector (Sacha Baron Cohen). As the inspector, Cohen looks like a more over-the-top version of Charles De Gaulle. All that Hugo has left of his father is a broken automaton which he spends his spare time trying to fix. He steals parts from, and eventually gets caught by, George Melies (Ben Kingsley). That name doesn’t mean a lot to young Hugo at first, but he later discovers that he is none other than the legendary pioneer of filmmaking himself. Melies was one of the first filmmakers to figure out that moving pictures could tell stories. “Hugo” is based on a book and its about the power of imagination, but it is also about Scorsese’s love of movies. At one point, Hugo takes of Melies’s daughter Isabelle (Chloe Grace Moretz) to see a movie in order to cheer her up. He believes that the movie theater is the only place where he can escape from reality. Viewers will also be treated to a history of film as well as footage from several key movies of the silent era. “Hugo” is a film buff’s dream come true. From looking at the early movies shown in “Hugo,” there really was magic in them. The less realistic the special effects were, the more creative and deceptive filmmakers could be. Melies was equal parts filmmaker and magician. Early silent films involved many tricks to feign depth and perspective. “Hugo” itself attempts this, and it contains some of the best 3D there has ever been. The third dimension is usually wasted by those who don’t understand the potential of it. In “Hugo,” 3D is not a gimmick but rather a way to add a layer of physical depth, and make this complex world of mazes and winding staircases even more immersive. I am not a cheerleader for the cause of 3D. However, if more directors used 3D the way Scorsese does here, then perhaps this new trend won’t necessarily spell the demise of movies as we know them. As with any great movie, none of the special effects would mean anything if they did not support a great story. “Hugo” is an uplifting fantasy that is also very real. It balances out its darkest moments with comedy. Best of all, “Hugo” is not just about Hugo. The longer the audience spends in the train station, the more it gets to know the characters that occupy it. The subplots involving the inspector’s attempt to woo the flower shop owner (Emily Mortimer) and another including an old man at odds with a small dog are entertaining and actually tie in with the story as a whole. These segments of “Hugo” reminded me of the subplots seen in the windows of the apartment complex in “Rear Window.” Neither of these movies would be able to function without their settings, or the variety of people who occupy them. The latter part of Scorsese’s career has been a mixed bag. While he won his first Oscar in 2006 for “The Departed,” few of his latest efforts have matched the brilliance of his earlier efforts. “Hugo” is his finest achievement in years, but there is just no way to compare it to his earlier works. There is nothing wrong with creating something that defies comparison. Even if no one is shot in the head or shoved into the trunk of a car, “Hugo” could only have been made by Scorsese. His version of Paris transforms the City of Lights into something much grittier. The Paris of “Hugo” looks more like New York via “Gangs of New York”: snowbound, destitute, and industrial. Then there is Hugo’s world, which is one marked only by turning gears, with the great city surrounding him being just outside his reach. The only light of hope that ever shines is from a film projector. In a way, Hugo is Scorsese in his youth. During his childhood on the mean streets of Little Italy, the movies were his only means of escape. Even as time passes, movies will always remain. The fact that “Hugo” is about a young boy saving the lost films of a once great artist is the kind of warm, moving act that doesn’t usually occur in a movie directed by Martin Scorsese. Even though “Hugo” claims that humans are just parts of the larger machine of the world, that can’t explain the feeling of being moved to tears by the movie’s end. There is a scene in “Hugo” where Hugo and Isabelle watch “A Trip to the Moon” for the first time, and learn that each frame was colorized individually by hand. In the present, a camera can do that, and a computer can create any special effect imaginable. Therefore, it is hard for any movie made today to ever feel hand-crafted. When as much care, love, and devotion goes into making something like “Hugo,” it is then that the director’s, and not a computer’s, fingerprints are all over it. This is one of the best movies of the year. As a side note, has anyone noticed that whenever a major movie is released that takes places in a foreign country but is spoken in English, all of the characters have British accents? When will Hollywood get that people can tell the difference between a French accent and a British accent? This entry was posted in 3D, Ben Kingsley, Chloe Grace Moretz, Emily Mortimer, French, Georges Melies, Hugo, Jude Law, Martin Scorsese, Movie Review, Paris, Sacha Baron Cohen, Silent Film, The Invention of Hugo Cabret on November 26, 2011 by ian0592.